Recently, my dear friends Johanna and Andre flew off to Budapest, a place where they spend as much time as humanly possible. Though neither is actually Hungarian, Andre was raised in the area and Johanna is a fervent Hungarophile. Of course, a perfect sendoff had to involve some sort of Hungarian cooking. I’d never actually cooked a Hungarian meal before, so to give them a proper viszontlátásra, I thought I’d give it a try. Perusing Johanna’s myriad Hungarian cookbooks was a little overwhelming; while all of the recipes are in English, all of the titles are in Hungarian and the lack of headnotes made it tough to figure out what I was getting myself into. 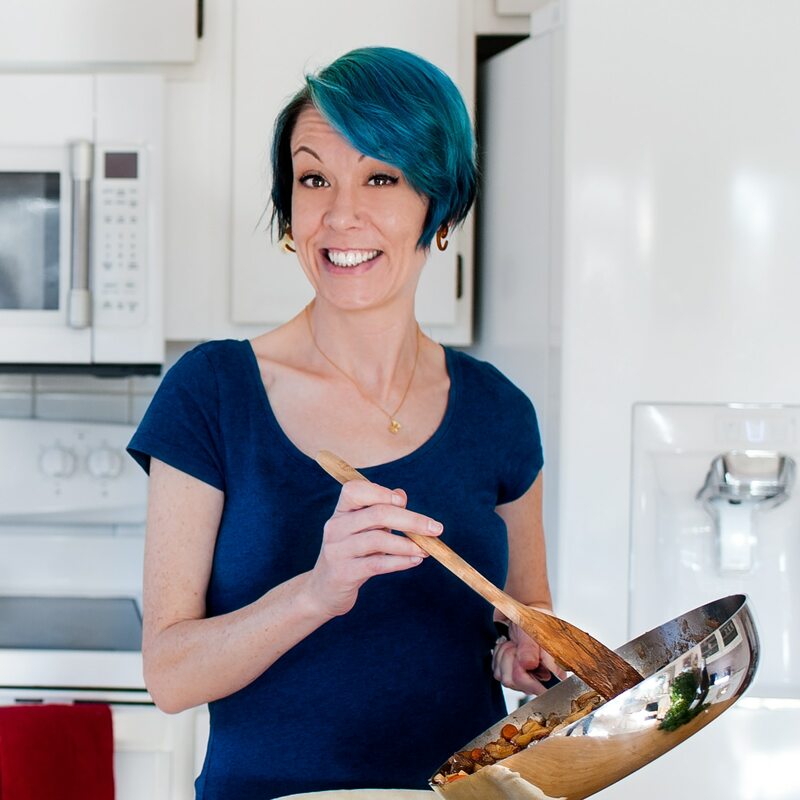 But I’m a sucker for a culinary challenge – yup, the longer the recipe, the more excited I get – so the idea of making a recipe with a dubious outcome actually turned me on. Yeah yeah, I should look into that. In Hungary, rostélyos is a family of dishes that involve thinly-cut steaks in a number of possible formations. The steaks can be braised, fried, stuffed, or rolled, and cooked with a series of different ingredients. The cut of beef you use is flexible – I used sirloin, though a butterfly or skirt steak would work well, as long as it’s not too fatty or too dry. If you’re not rolling your steaks, you could even use a bone-in cut, like a T-bone. The key is to pound your steaks very thin with a meat tenderizer, which will allows them to easily absorb the flavorings in the recipe. 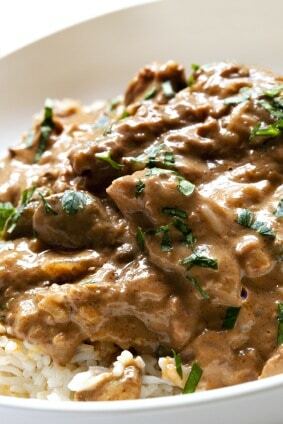 This particular Hungarian beef recipe, esterházy rostélyos, is modified from The Cuisine of Hungary, by George Lang. It’s an incredibly rich, savory dish that originally called for a quarter pound of lard and even more cream. I lightened it up a bit (yes, this is actually the low-fat version. Heh) by swapping out some ingredients, but the end result is relatively authentic, according to Hungarophiles Johanna and Andrea – thinly-pounded sirloin steaks, braised in a savory-sweet sauce of sour cream, onions, sweet root vegetables, pork sausage and mustard. My first bite almost caused me to bounce out of my seat, and for the first time in a very long while I thought, “OMG, this is the best thing I’ve ever cooked in my life.” Even though I’m prone to hyperbole and the occasional gratuitous superlative, I wasn’t exaggerating this time. According to Lang, esterházy rostélyos is a recipe from the Hungarian region Transdanubia, and shares a name with an uncrowned king from the area. Miklós Esterházy, who built Esterháza – also known to some as the Hungarian Versailles – was immortalized in this hearty dish, which apparently symbolizes his hearty constitution. So there you go. Talk about the perfect Hungarian beef dish! Esterházy Rostélyos - a hearty Hungarian beef recipe - is a steak dish braised in a savory-sweet sauce of sour cream, onions, sweet vegetables, sausage and mustard. With a meat tenderizer, pound meat until thin and set aside. Take one carrot, one parsnip, and half of the celery root and cut into thin slices. Set aside. Take the remaining carrot, parsnip and celery root and cut into matchsticks. Set aside, separate from the sliced vegetables. In a large frying pan over medium-high heat, cook pork sausage crumbles until most of the fat has been released and the sausage is cooked well. Remove sausage to a bowl, leaving fat in the pan. Add beef to hot fat and cook for one minute on each side. If necessary, cook the beef in stages so as to not overcrowd the pan. Remove beef and set aside. Add the chopped onion and the sliced vegetables (not the matchsticks!) to the hot oil and cook for 5 minutes, stirring constantly to prevent burning. Add 2 cups water, the bay leaf, salt and pepper. Grate the rind from the lemon over the cooking vegetables and stir well. Reserve the rest of the lemon. Return beef slices to pan and lower heat to very low. Cook for 5 minutes. Remove beef from vegetables and again set aside. In a blender, puree cooked vegetables, cooking juices, mustard, flour, sour cream, and the juice from the reserved lemon. Add a few tablespoons of water if necessary to achieve a smooth sauce. Pour vegetable puree back into frying pan and add cooked beef and sausage. Cook on low heat, stirring occasionally, for 10 minutes. In a small pot over medium heat, melt butter and add matchstick vegetables. Cook until vegetables are soft (remember, the celery root takes longer to cook, so be sure to poke at it with a fork to see if they are soft before removing from heat). Pour meat and sauce into a large, shallow bowl and top with matchstick vegetables. Sprinkle with chopped parsley and serve.